The Chevrolet Spark is a vehicle that nobody really wants, but in all honesty fits the needs of so many people, only if you give it a chance. 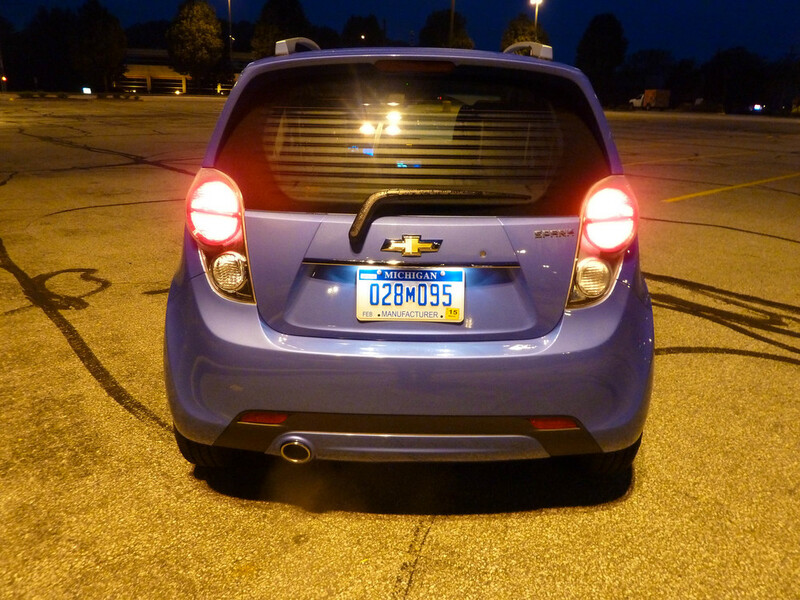 Upon getting the Spark, I felt that it would be a standard small car from Chevy that offered no room and had basic features, kind of like a rental or fleet car. After a week of driving it though, my feelings are now totally different. Built in Korea on basically what is a Daewoo, the Spark is the smallest car in the Chevrolet lineup. It is powered by a small 1.2L four cylinder with about 85 horsepower. The model we tested was the 2LT model with a 5-speed manual on the floor. They call the color Denim, which stands out in any parking lot when sitting in the sea of neutral colors that most people seem attracted to anymore. The 2LT model came loaded with options for a small, affordable car. While having the Spark for seven days, here is what we found. The look of the Spark is unique and sharp. 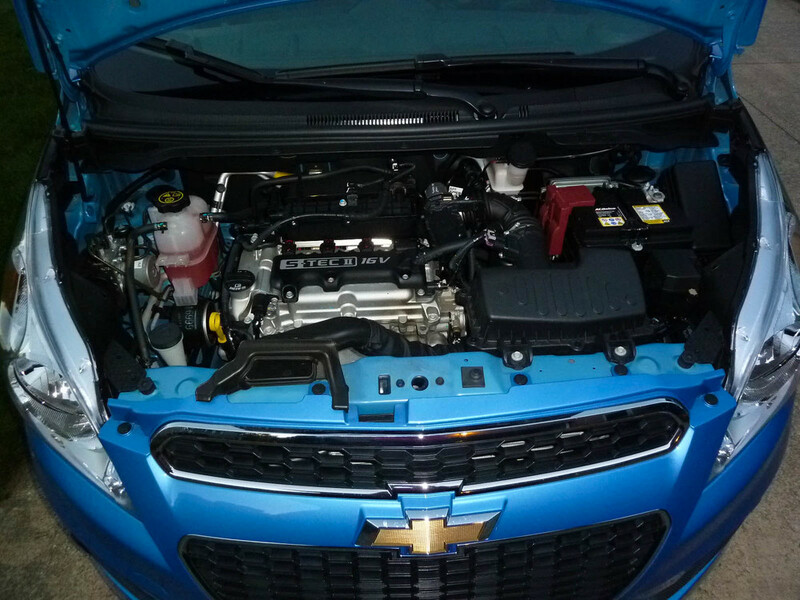 The angles are all there and Chevrolet did a good job making sure it doesn't carry the looks of an econobox. It doesn't hurt that it was in Transformers a few years back either. The blue that was on our test model really popped when you let it sit in a parking lot with the common silvers, black, pewters, and other boring colors. Whenever I left the car in a parking lot, I'd find myself looking back and admiring how much the car stuck out compared to the crowd. Not only because of the color, but because of the striking design. The wheels are 15" machine-faced aluminum. They looked good, but I think could be bigger. When looking at them I almost had to prove to myself they were 15's by reading the tire sidewall, they really look like they are 13's. One of the biggest things about the exterior we found was that nobody believed it had four doors. Hiding the rear door handles is good for styling, but for sales I am wondering if this could pose a problem. Everyone who looked at the vehicle with me honestly thought it only had two doors. Personally, I liked the hidden door handles, but found them to be slightly awkward to pull open. 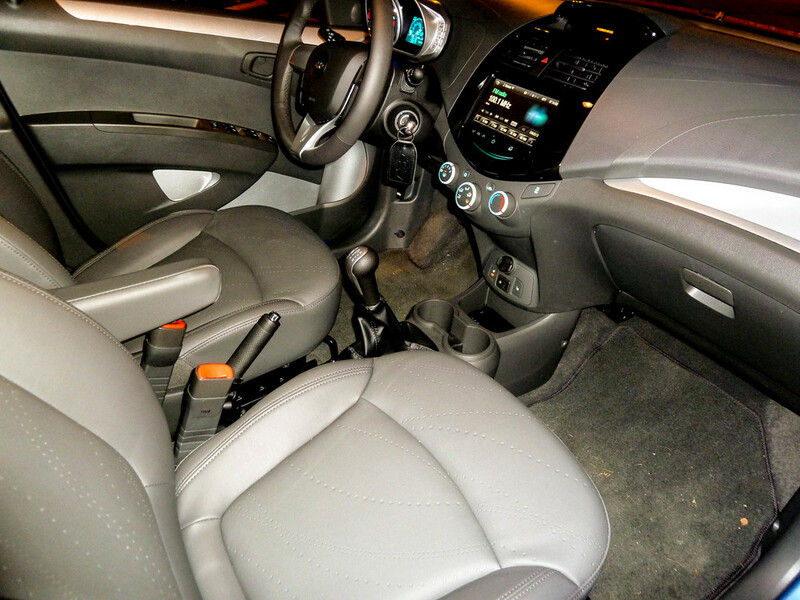 Chevrolet has always been known for their world class interiors. We all know this. Actually they really haven't... This is a shame because even the Corvette from 2013 was being torn apart everywhere for the awful interior it was given. Going into this review, I was not expecting much. Once again though, totally surprised in many areas. This 2LT model came with heated leather seats. They were comfortable and easy to operate, manually. The dash, trim, and anything else has been changed from the classic GM Tupperware to a new, rubbery style that looks and feels better. I will say that the swoopy, modern lines carved on the dash are a little weird, but it seems everyone is trying to do something to spice up their interiors anymore. There is an optional painted trim package that matches the exterior, but ours was just the standard silver. The steering wheel assembly with the gauges attached is pretty clever, but I found my hand hitting the gauges when I would reach for the top of the wheel. They moved the tachometer, fuel, mpg's, and odometer to this motorcycle type of digital readout. Clever idea, but somewhat difficult to read and the control buttons were tiny. I prefer a bigger tach that is more precise. The drivers side door handle where my elbow would rest was pretty hard, I had to adjust my positions on the wheel to avoid elbow pain. Overall though the interior was solid, looked nice, and didn't have any squeaks or rattles. This was a great surprise and really shows promise for GM, when you consider this is their smallest and cheapest car. I am 6'0" tall and fit very comfortably with no problem. The back seat isn't meant for full size adults, although they can fit if the people up front want to give up some leg room. This thing legitimately has a 7" touchscreen radio in it. The most amazing thing is that the lowest model in the Chevy lineup has this. When I saw this on the options sheet I was blown away. Being my first use of the MyLink system, I felt it needed to be really used and tested thoroughly. This system is what GM is really pushing with their technology integration. They show it on the commercials being the first car to use the iPhone's Siri, so it is a big deal. First let me state that it looks gorgeous. The screen is bright and surrounded by a gloss black trim piece that really compliments it. The four touch style buttons on the face for volume, home, and power were nice, but easy to accidentally touch. I paired my iPhone 5 with the system no problem and was able to do almost anything through Bluetooth alone -Play music, use apps, and even talk to Siri. Phone calls were reported to be fairly good by users on the other end. This leads me to believe we might finally be at the point in history where hands free calling isn't something everybody dreads. 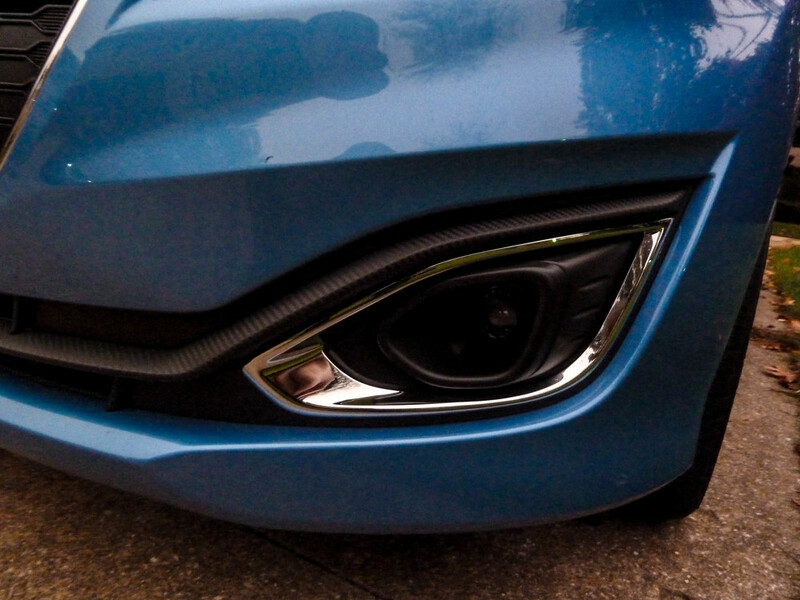 Onstar was on our tester model, which worked just like it should. We called for directions and they were magically put onto the MyLink touchscreen with arrows leading the way. Onstar though is a pay per month or year service, so be ready to give GM $29 a month for the full featured package. The biggest hurdle for me on the MyLink radio is that it has no slot for a CD. I know... nobody uses them anymore, but it just blows my mind to think that CDs are going to be dead soon. The USB plug and Aux input jack were down below the dash by the cupholders and heated seat controls. When my phone was plugged in via USB, it really did not charge fast at all. A Belkin USB adapter for the 12v cigarette lighter charges at double the speed; this surprised me considering most buyers of this car will be using this plug daily. I found the MyLink system is something that shouldn't be on this small, affordable car. This is a setup you would have found on a six figure Mercedes a few years back. 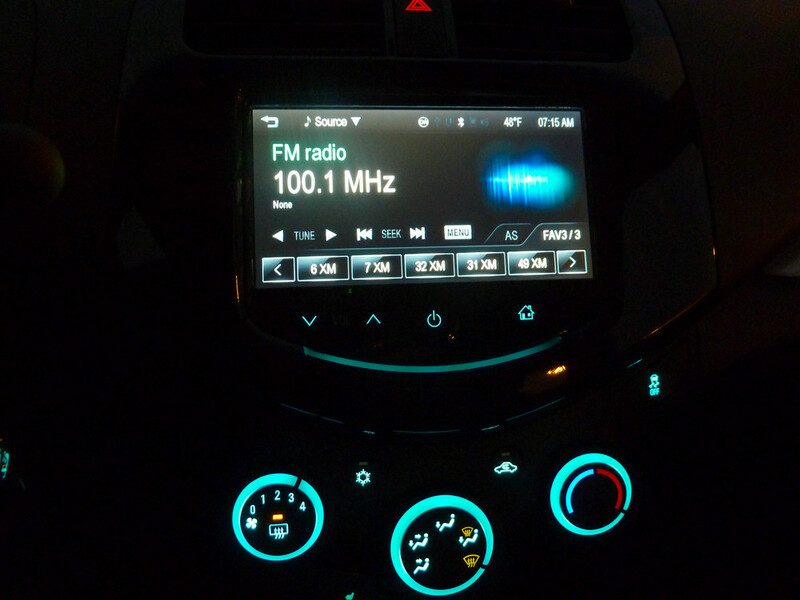 The MyLink has shown me that manufacturers can make an amazing car stereo that connects your device and looks great as well. If these start coming on everything, the aftermarket car stereo market will be dead soon, if it isn't already. Lets get one thing out there first. This thing has 85hp.... actually Chevy says 84hp. I have never driven a double digit horsepower car, ever. Once again, I had to give it a chance. When you factor in the Spark weighing about 2300 lbs, it actually moved pretty well. This is not a ZL1 Camaro by any means, but for driving around town, merging onto the highway, and anything else, it did the job just fine. The clutch, brake, and gas pedals all worked super easily. Shifting was a bit rubbery and blah, which I don't get. Why can't manufacturers actually put a nice, solid feeling shifter on every car? The Spark does not have the Go-Kart like handling of a Mini Cooper, but it held its own around corners. Body roll was there, but honestly not that bad. The braking felt adequate too, if not better than adequate. Over the course of our week long review, we averaged 37.6mpg and a tank of gas lasted us a week of daily driving and running around. Our routes consisted of a mixture of city and highway with an average speed of 36mph. This was way better than the window sticker claims of miles per gallon, which is great news for your wallet. If you take into consideration you are driving the lowest car in the Chevrolet lineup that cost $16k, this thing drives absolutely perfect. If you want more power, better handling, better braking, or the ability to tow a 3 axle trailer, this vehicle isn't for you. But if you are looking for a small, easy to drive vehicle that doesn't break the bank and has all the features you need, the Spark delivers. Flat out, it delivers. For our reviews, we try to find out what "the people" think. This could be from online, social media, random people on the street or whoever wants to talk about this car. These comments do not reflect what we at Hoagies Garage think, but we do feel the opinions are interesting to hear. Doing a quick Twitter search when we got the car, we found people actually saying they want a Chevy Spark. Lots of positive reactions and desire to own this car. In person though, that was another story. The Spark got everything from "What the hell is that", "Nice clown car", "Why are you driving a jellybean", and any other negative econobox comment. This all falls back on giving the Spark a chance though. Once I started listing the features, the price, the mpg - people stopped making fun and started listening. The size scares people, it really does. Everyone wants to have room so they can haul a dead Elk and they want to feel safe hauling that Elk. This offers little room, but it does have ten airbags and active stability control, so it is very safe. 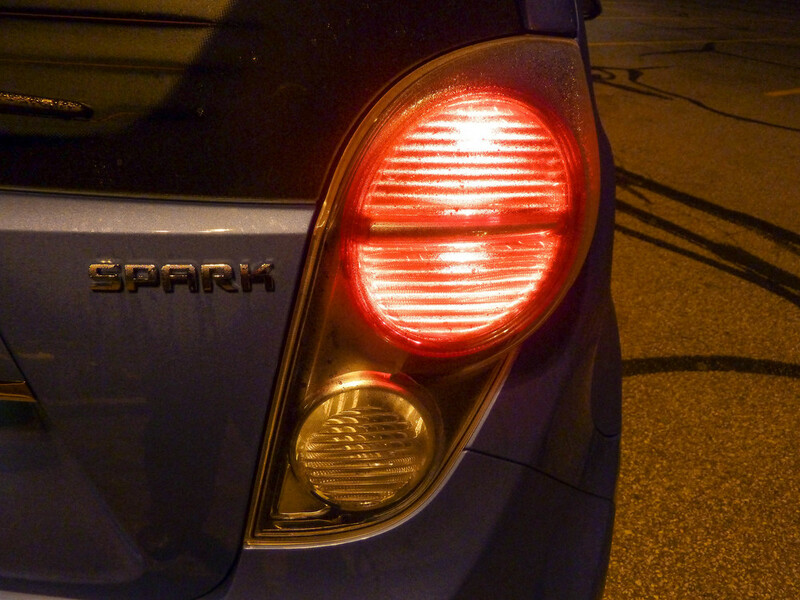 The Spark is a car that almost everyone can live with. Most people aren't hauling an Elk, towing a boat, racing a Viper, or driving over 70mph. This will meet the needs of almost everyone out there, they just have to give it a chance and accept the fact that Chevrolet actually can make a great small car. Sticks Out - Striking looks and colors make it look unique. MyLink - The system is a near perfect compliment to your smartphone. Loaded - More options than you would ever expect from a small Chevy. Interior Quirks - Non-lighted window switches, touchy volume buttons, & slow charging USB Port. Wheels - They look much smaller than a 15"
Perceptions - If you care what people think, you will have to do some convincing it seems to make them realize this actually is a great little car.